Lanyards, sometimes referred to as cows tails or lobster claws, come in many forms. Common uses include connecting to an anchor, assisting in vertical or horizontal progression, and/or holding position where needed. You can buy adjustable and non-adjustable lanyards or make them yourself. Those from manufacturers will often have sewn termination points instead of knots and adjustable versions will usually consist of mechanical rope grabs or buckles — they also cost considerably more than DIY options. A climber uses three DIY lanyards while aid climbing. Customization! Length, color, rope diameter, composition, etc. Climbers use DIY lanyards for work positioning while rigging a tri-bi-mono-pod during an Earth First! Climbers Guild camp in Oregon. Know your equipment. Use equipment rated for climbing. Don’t use rope or gear that you would not otherwise climb on. Retired gear should not be made into a lanyard! Know the history and condition of the equipment you’re using — if you have doubts then best not use it. It’s good practice to label, track, and retire lanyards accordingly. Dynamic or Static? It depends. Dynamic lanyards have the benefit of absorbing impact forces resulting from a fall. Use them to connect to static systems, move across multiple points, or to protect against a fall. Static lanyards (made from webbing or static rope) lack the elastic properties found in dynamic lines and do a better job at reducing unwanted movement or bounce. Use them when you plan to work or move directly on loaded lanyards. Examples of this would be progressing up a tree, sitting back on your lanyard for positioning, or restraining yourself from an edge. A fall on any static system can result in serious injury or death. Use proper technique when climbing with static lanyards to avoid shock loading your system. Use a shock absorber or prusik hitch as a link to your static lanyard to reduce the impact on your body in case of a fall. How about the diameter? 10.5mm and 11mm diameter lines are the go to if you expect your lanyards to take a beating. Wrapping your lanyard around trees or beams and/or running it over edges will reduce the life span and integrity of your lanyard. Thicker lines are a good choice for training programs or extended actions where prolonged wear and tear is likely. That said, 9.4mm to 10mm lanyards are lighter, less bulky, and easier to work with. They’re plenty strong but are best reserved for experienced climbers and their condition should be carefully monitored. Know your knots. The figure eight follow thru, eight on a bite, and barrel knot/scaffold knot, are the three most useful knots for tying your own lanyards. The figure eight follow thru is the knot of choice for tying a lanyard directly to the master point of your harness (the overhand follow thru is a low profile alternative but is much more difficult to untie once firmly loaded). The figure eight on a bite is great for when you’re able to clip in directly or want carabiners to rotate freely. The barrel knot is best in situations where you want to use minimal rope or capture a carabiner in a specific orientation — this helps restrict movement and prevent cross loading. Keep your knots low profile! The gain (eye of your knot) should be kept short to prevent snagging and conserve rope length. The tail of your knot should be about a palms width and no longer (it’ll just get in the way). I often tape my tails so they don’t flap around once I have everything adjusted. Lanyard lengths cut from dynamic climb line and labeled accordingly with length, diameter, and date of manufacture. Length. This is highly dependent on your intended purpose. 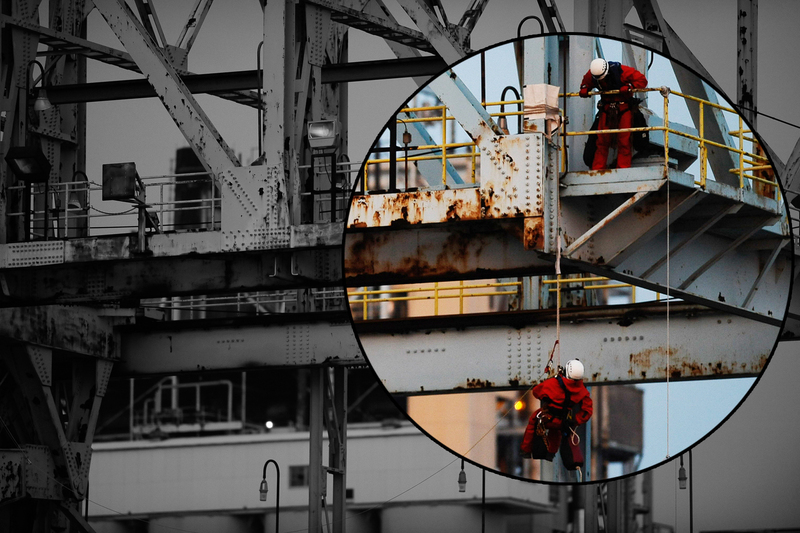 Short lanyards are common practice in rope access or rock climbing where you’re often connecting lanyards to devices or anchor points within reach. Longer lanyards are necessary for climbing trees that require you to wrap large diameter trunks or extend to limbs beyond your reach. Regardless of what you choose it’s often useful to have at least one lanyard that’s an arms reach — this includes the knots and carabiners. A 6 to 7 foot (~2m) length of rope is a good place to start. If you want to tie two lanyards consider doing it with a longer single length of rope — about 12 to 14 feet (3.5-4.5m) or more depending on your needs. This alternative will leave you with a third point of attachment between the two lanyards (see below). Lanyards extending beyond your reach require specific techniques and should be used with caution. They are best restricted for use as a flip line, restraint line, or progression in trees. Two lanyards tied from one 12ft length of dynamic line. The bridge (bight of rope isolated between the lanyards) serves as another point of connection. Adjustable lanyards. There are multiple ways to do this but the simplest and most recognized method uses a prusik loop (6mm works well with lanyard diameters of 9 to 11mm). Start with a short prusik loop and tie a prusik hitch around your lanyard. Clip the prusik back to the master point on your harness (you can avoid using a carabiner by retying the prusik loop directly to your harness as seen in the image below). You can also fasten a quick link/screw link beneath the prusik hitch on your lanyard and back to your harness as pictured — this will tend the prusik and allow you to shorten the lanyard with one hand (this technique was shared to me by a friend who had climbed with Robin Wood, a German environmental organization). Adding a prusik as a point of connection to your lanyard can help reduce impact forces resulting from a fall. A prusik will slip slightly before locking up if subject to high loads or forces. This absorbs energy and will reduce stress on your overall system and body. Adjustable lanyard — notice the four components: barrel knot restricts carabiner movement, prusik captures preferred lanyard length, screw link tends prusik for one handed adjustment, eight follow-thru tied directly to central point on harness. The addition of a quick link allows for one handed operation when using a prusik to create an adjustable lanyard. It’s important to note that there are many options and nuances for lanyards not covered here. If you’re unsure of something ASK! Input or tips? Please share. The potential risk for damage from abrasion or cutting must be evaluated and eliminated anytime softgear makes contact with something. This is particularly true anytime softgear runs over an edge or rubs on itself since the components of softgear, nylon and polyester, are not very resistant to abrasion or heat. Remember – rope and webbing are extremely strong when pulled under load but can cut quickly when subjected to lateral abrasion while under tension. Always make sure to protect your rope and other softgear from sharp or abrasive edges. Evaluate all points of potential contact and assess whether or not some kind of protective barrier or space must be made. Building anchors high or directing ropes away from edges can eliminate the chance of abrasive damage all together. A heavy duty canvas rope pad and commercial edge roller both include attachment points for tie-off cord. A heavy canvas tarp folded over itself or rubber car/floor mat work well as edge protection. Commercial rollers, gutters, and other forms of edge protection are also available. Tie these back or secure in some fashion to keep in place and prevent from falling. Avoid using synthetic materials in cases where friction from moving lines can generate enough heat to melt both the rope and intended protection. A rope sleeve cut and sewn from a reused banner. A velcro closure helps secure the sleeve around a climb line and a grommet is used for a prusik tie back point. Rope sleeves are another common and useful form of rope protection that can be secured directly to the rope and held in place with the use of a tie back or prusik. Buy these or save some money by making your own. Canvas and old banners can be cut and sewn together for great rope protection. Rope sleeves like these are easy to carry and great for protecting against edges while on rappel (sometimes referred to as over-the-side hot spots) since they are simple to move and secure with a prusik. Here a canvas tarp is used to cover a vertical beam and protect against sharp edges at the anchor. A rope sleeve is also used and carefully positioned by a climber prior to navigating the lip below. The rope sleeve protects the climb line from the edge on the lip above and is easily adjusted and secured in position with a prusik. Note: Don’t just protect your rope – protect what you climb on. 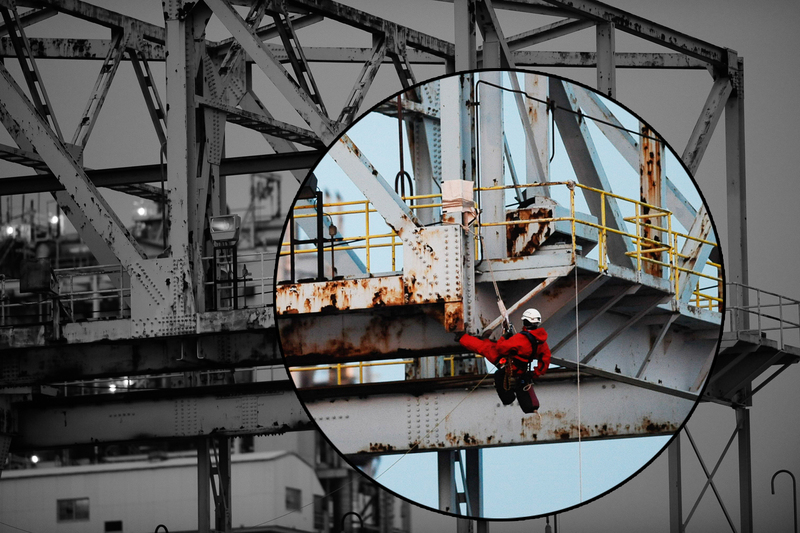 Use edge and rope protection to reduce damage to anchor points or areas subjected to tensioned lines. Be smart and place where necessary to prevent damage to property when working in industrial or urban areas. Use canvas wraps to prevent girdling trees and damage to the natural environment.